Whether you're organising a small Company Celebration or a hugh Corporate Event, we can provide the Disco that will be perfect for your event. A2B DJs have many years of experience and are specialists in providing entertainment for Corporate Events of all sizes. 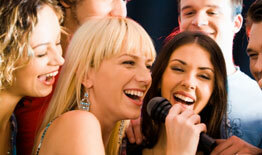 We will create an evening of entertainment and a vibrant atmosphere to really remember. So Contact us now to discover how we can help you create the event you really want on 087-9850714 or click here to fill out or contact form. Chuckies Playground Togher, AIB, Mac Donald's, Scozi's Resturant, Logitech, Penny's, Cope Foundation, Debenhams Mahon Point, Brown Thomas, The Cork University Hospital and lots more.